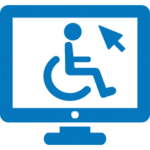 An accessible website is a site that allows people with disabilities and older people to surf the same level of efficiency and enjoyment as users. About 20 to 25 percent of the population has difficulty accessing the Internet and may benefit from more accessible Web content, according to a 2003 study by Microsoft. The website believes and works for equal opportunities in the Internet space for people with varied disabilities and / or assisted by computer aided technologies. The “Accessible Website” is an initiative of “Access Israel” and the Israeli Internet Association. The character is posted on sites where adjustments have been made to make them accessible to people with disabilities. The purpose of the label is to promote public awareness of Internet accessibility and to inform the site’s visitors about its accessibility. The site complies with the recommendations of the Israeli standard (IS 5568) for the accessibility of content on the Internet at the AA level, and the WAGC’s WCAG2.0 recommendations. It is also optimized for display in popular browsers and for mobile phone use. This site has made extensive accessibility adjustments that include, among other things, semantic and informative implementation of assistive technologies, navigation and operation with a W3C keyboard only, color adjustments, and the addition of reference labels and guidelines in forms for the benefit of all users. To get the best experience with screen reading software, we recommend using the latest NVDA software. We have added a accessibility component that is adapted to WordPress (a link to the https://wp-accessibility.org) component, which allows you to control font sizes, block overrides, guide texts for nvda and jaws, keyboard navigation that makes it easy to browse the site without using Mouse, compatibility to the site for browsing with nvda and jaws screen reader, creating black and white color contrast / contrast, animation block and any element on the site to highlight links. To get the best experience with screen reading software, we recommend using the latest NVDA software. Please note that despite our efforts to make all pages available on the site, the attached documents (such as PDF, Word, Excel) are in the process of being accessed and we are working to complete this. If you require a document that appears on the site and is not accessible, please contact us with a link to the site and we will arrange for it soon. If you find a component or page that is not accessible on the site, we will be happy to contact you and we will arrange to fix it as soon as possible. If you encounter an accessibility problem while browsing the site, we will be happy if you report it to us and we will fix it soon.